That feeling when you get home from a long day at work…crank up your favorite jam, and dance like no one’s watching, all while bathing in the highs of the vocals and the lows of the bass. The immense feeling when a choir elevates sound to the maximum. Mary Droppinz aka Alyssa Johnson born in Omaha, Nebraska, pulled inspiration for beats and musical brilliance from her father’s love for deep drum sounds. Exuding this through her sound, she is nothing short of inspiring. With initial desire and passion of being a fashion designer, Mary found the all mighty power within music and recreated the sensations of pure bliss for her audience on the dance floor. This sound isn’t your typical heads down, lights out, too cool for school techno. Like it did for her, this sound was designed to take dark moments and transform them into moments of euphoria. Mary Droppinz curates pure passion for the genre and all its potential to heal not only spiritually but sexually as well. Don’t get it twisted though: given the right moment to use her weapons, Mary will bring the heart racing, body shaking, dirty, heavy hitter beats. This has landed her several shows (such as Exchange LA) all across Los Angeles and beyond. Since making LA her home, Mary has been dedicated to perfecting her craft to make speakers and music lovers shake the booty bass. 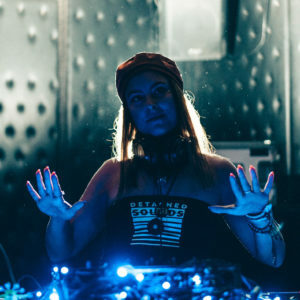 With an arsenal of melodic weapons, bass line belters and deep knowledge of the connected party culture, Mary Droppinz wields the deep techno arts like a DJ well beyond her years. Keep an eye out for this phenomenal artist on the rise.